Hardly a month goes by without Japanese Knotweed control being in the news. It’s headline-grabbing stuff with its invasive nature, impressive persistence and horribly destructive habits. This week a particularly distressing inquest heard about a troubled man who had murdered his wife after becoming paranoid about Japanese knotweed growing on a golf course near their home. He then killed himself. His suicide note said he’d acted because the balance of his mind had been disturbed by knotweed near the couple’s West Midlands home. Having tried and failed to curb the plant’s growth, the man’s fear of the structural damage the plant can cause led to his “growing madness”. It’s a terrible tragedy, involving a clearly disturbed mind, but it does illustrate how significant the issue of knotweed can appear to some people. Exaggerated stories in the press on the effects of Japanese knotweed on property do not help. With this in mind, it was an aim of the recent RICS guidance to set the record straight and allay home-owners’ unfounded fears about the level of devastation knotweed could lay upon their properties. The RICS paper and the code of practice from the PCA that was allied with it, have demonstrated that Japanese knotweed control is rarely so problematic that it can cause substantial devaluation of property. At the same time, a recent piece of research claims only 44% of gardeners would recognise Japanese knotweed if it turned up in their garden. The study was carried out by the online garden retailer Gardening Express, which was shocked at the results. It appears knotweed, while famously destructive and able to overwhelm other plants, damage concrete and buildings in a very short space of time, isn’t widely recognised. And it’s about time gardeners wised up. Gardening Express quizzed 600 customers, asking them to identify photos of ten plants and decide whether they were a weed or a flower. Apparently 56% of those surveyed said if the plant turned up in their garden they would probably welcome it. While Japanese knotweed is a serious threat and a frighteningly impressive adversary, it actually looks very beautiful with its creamy flowers and shield-shaped leaves. But the plant is such a pariah that some mortgage lenders have refused loans on homes where the weed raises its not-so-ugly head. Selling a home that’s suffering a knotweed infestation can therefore require additional surveys and professional treatments, which a lender should now be aware of (thanks to the RICS guidance and the PCA Invasive Weeds group). So how to you recognise the early signs? 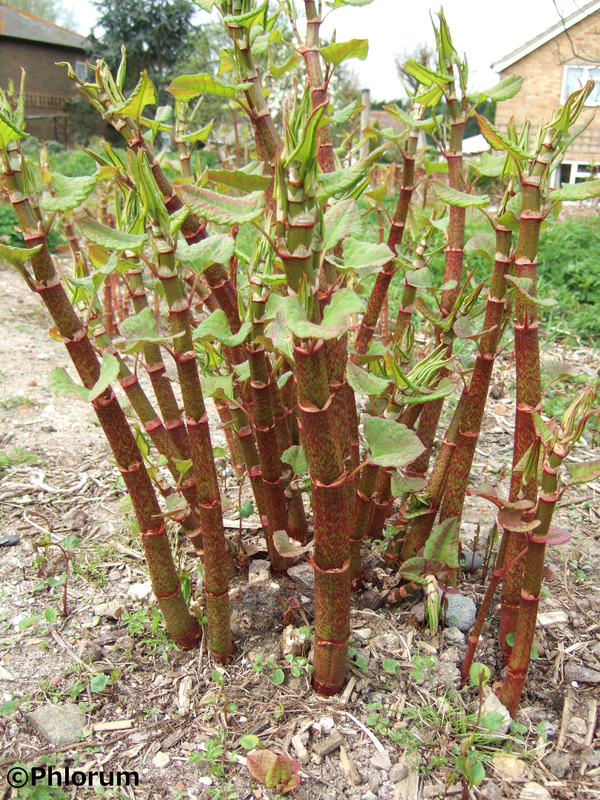 There is some useful information on our knotweed identification page. Small, red-purple shoots, and bright pink crown-bud ‘thumbs’ appear in early spring. These quickly grow into large, hollow, asparagus-like spears before developing into mature, bamboo-like stems with attractive purple speckles in early summer. In winter, large patches of growth persist as straw-coloured ‘bamboo’ canes, which can often make them easier to spot than other vegetation, which dies back at this time of year. 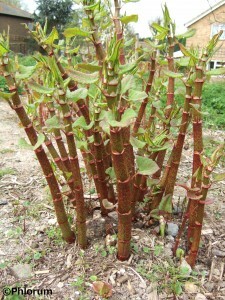 What about Japanese knotweed control? For domestic properties, often the most effective treatment is the use of approved weedkillers, applied by licensed operators. However, these usually need to be applied over several years. Some home-owners have attempted knotweed control themselves, with weaker chemicals available over the counter. If you fancy having a go yourself, remember that your work will not be recognised by a mortgage lender, which could affect your ability to sell your property, or the ability of your neighbours to sell theirs. The latter situation could result in litigation as your neighbours seek to redress the nuisance issues you might have caused them. In any case, if you don’t do a 100% perfect job, the knotweed will come back. It’s far better to get the professionals on the case, save yourself all sorts of hassle and minimise the stress. And what about Japanese knotweed removal costs? It might surprise you – in a good way. Get in touch for a reasonable quote for getting rid of it once and for all, safely, legally and professionally.